Also see the Air South timetable gallery! Air South was formed as Nationwide Airlines Southeast in 1967 and began flying in January 1968. Shortly after F.E. 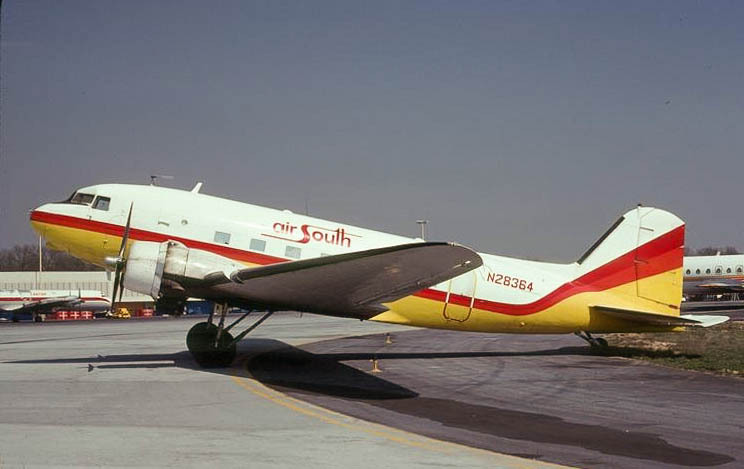 Howe was elected president of the company in November 1968, the name was changed to Air South to better reflect the operations of the airline. In the late 1960s the company served points in Georgia, South Carolina, Alabama, Tennessee and Kentucky from a hub at Atlanta. During the 1970s Air South concentrated on markets in Georgia and South Carolina. The airline merged with Florida Airlines in 1975 and continued to operate in conjunction with that company until 1980. 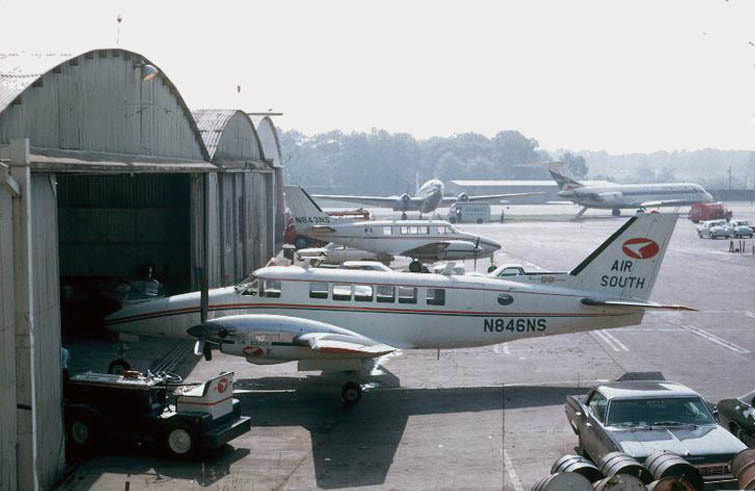 Air South's Beechcraft B-99 N846NS and Queen Air N843NS seen on the maintenance ramp at Atlanta in 1969. Both aircraft are painted in the basic colors of Nationwide Airlines Southeast. 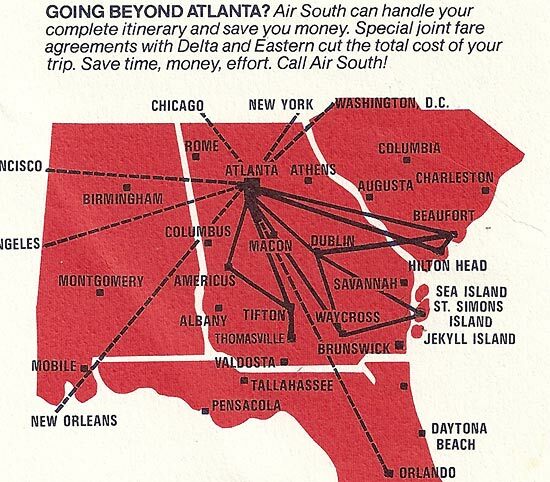 An Air South advertisement from 1969 depicting a B-99 and listing service to Albany (GA), Atlanta, Augusta, Birmingham, Brunswick, Nashville, Greenville, Spartanburg, Sumter, Tifton and Georgia's Golden Isles. 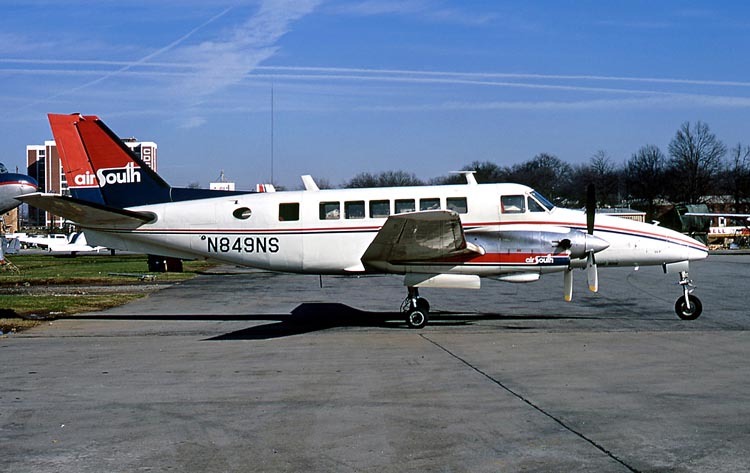 Air South Beechcraft B-99 N849NS at Atlanta in February 1974. Photo courtesy of Bob Garrard. 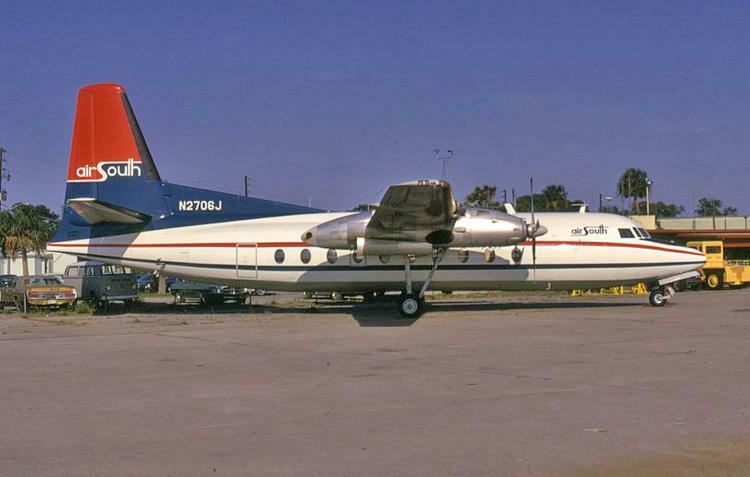 Air South operated several F-27s from Atlanta to St. Simons Island, GA, Hilton Head Island, SC, and Waycross, GA from 1973 to 1975. N2706J (msn 117) flew with the airline during 1974 and early 1975. Air South route map from February 15, 1974 showing service to numerous small towns that no longer receive air service . In Spring 1975, Chicago investor Arthur Allyn purchased controlling interest of Air South, Florida Airlines and Shawnee Airlines. By the end of 1975 their schedules were consolidated although the airlines continued to operate as separate entities. (See the timetable gallery.) DC-3s replaced the F-27s after the merger and the planes flew interchangeably with Florida and Air South. N28364 (msn 4108) is shown on the cargo ramp at Atlanta in March, 1979. Martin 404s joined the fleet in 1977 and eventually replaced the DC-3s. N257S (msn 14110), named "Sea Island", is pictured at Atlanta in 1978. 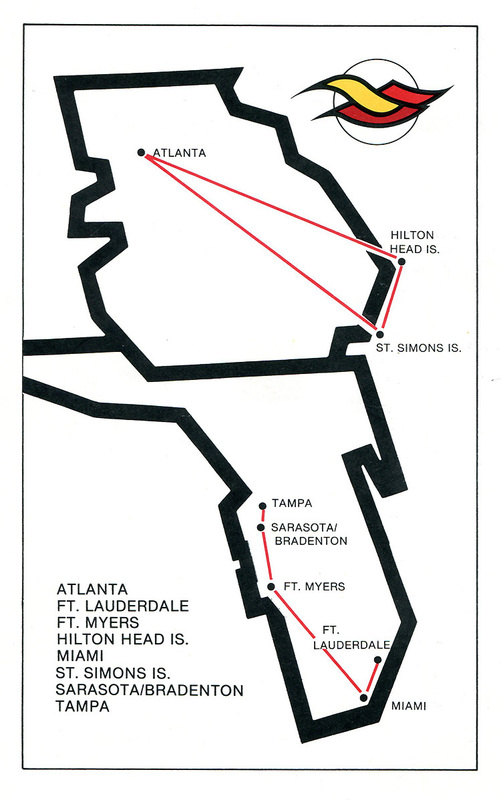 Air South / Florida Airlines route map effective December 15, 1978 showing the two separate route systems. Air South / Florida Airlines shut down on Friday January 11, 1980 and Air South's routes and assets were taken over by Ocean Airways which also folded later in the year. For additional timetable images and information, visit the Air South page at Timetable Images.